Helping people make better sense of lab results may be as easy as replacing the often-confusing “standard” range of a test with a more-personalized goal range in their health chart. Individuals managing chronic conditions, such as diabetes, may struggle with interpreting their own results without this context. They may also become less motivated to adhere to treatment plans when they see that they fall outside the standard range of a test. They may even suffer adverse outcomes if having a value in the standard range might be harmful for someone with their condition. Aaron Scherer, MD, Associate in General Internal Medicine, along with investigators at Laval University in Québec, the University of Michigan, and the University of Utah, believe that more personally relevant clinical values presented in a simple visual format might help people with chronic conditions better understand and interpret what their test results mean for their own disease management. Their report is now available in the Journal of Medical Internet Research. To test their theory, the team asked more than 6,700 participants to view a hemoglobin A1c test result as part of the hypothetical management of their Type 2 diabetes. The test result appeared in one of several various reader-friendly displays that included a standard range of values, a goal range, or both. Dr. Scherer and his colleagues assessed how well participants understood their test results along with emotional reactions to their results. 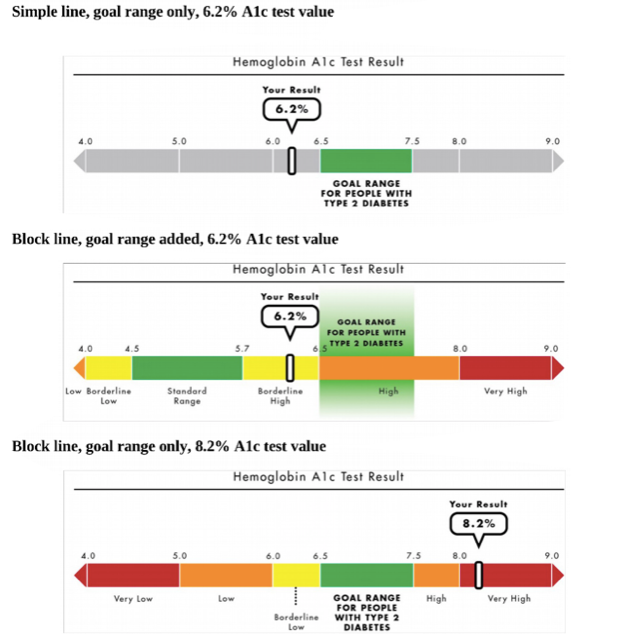 Providing people with simple tabular or visual displays that included goal ranges for A1c altered their perception of their test results in potentially important ways. Replacing the standard ranges for A1c with clinically acceptable goal ranges for people with diabetes resulted in higher comprehension of results and less discouragement when results fell below standard values. Critically, the results were the same regardless of whether participants actually had diabetes or not.